Its a hall located in the basement attached with a amphi theater lawn, specially designed for your personal functions. Our fully equipped Classic room, ideal for our budget travelers. Overlooking our beautifully manicured lawns, be assured of a beautiful morning when staying in this room, just pull back your curtains and enjoy a morning cuppa with nature’s best. Provides conference hall booking. It is facilitated with highly spacious and well equipped Conference Room, which meets the world class standards with all the requisite and latest facilities that allow convenient conduction of conferences, seminars, meetings, presentation or a get-together. The sophisticated ambiance of Conference Room is most suited to the corporate needs of your work. - Refreshing Welcome drink on arrival. The Deluxe Rooms are designed keeping in mind the needs of today’s traveler. Located on the second floor of the hotel, the rooms are appointed with all amenities that a discerning global business or leisure traveler needs. It offers an option of a king size or a twin bed and is equipped with a workspace that constitutes a writing desk and chair. It is believed that the measure of a good Bar is in the quality of its , its crowd, or its atmosphere. We, at BRAVURA GOLD RESORT Bar that offers the best quality or drinks, perfect ambiance and efficient Bar services to our guests. So just come to us and toss a drink to enjoy the evening at our BRAVURA GOLD RESORT Bar. a place designed for your get-together, here we catter for kitty parties, birthday parties, office get-together & etc. Featuring an exceptional combination of classic warmth and contemporary comfort, the Country Inn & Suites, Meerut is well suited for both business and leisure travellers. Hyphen Grand with 93 Rooms offers all special features of business hotel and make your stay comfortable and pleasant. We have Deluxe Rooms, Executive Rooms, Club Rooms, and Premium in the hotel. These rooms showcases comfortable interior style, a twin sharing room with wood finish beds. 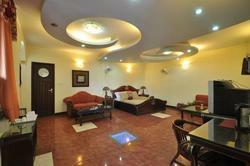 They consist of LCD TV, A.C, a bathroom with all amenities and a study corner. These rooms can accommodate 2 Adults individually who visit the city for business purpose.